There is more than one artist with this name: 1) Los Hermanos is a Brazilian band from the state of Rio de Janeiro, which mixes up indie rock with mpb and samba elements. 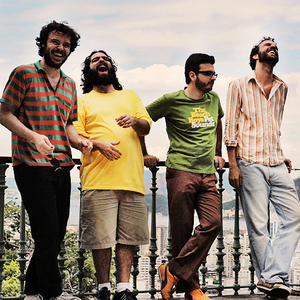 The band members are Marcelo Camelo, Rodrigo Amarante (both guitars, lyrics and vocals), Bruno Medina (keyboard) and Rodrigo Barba (drums). Official Homepage of Los Hermanos They recorded two demos that eventually found their way into the hands of Paulo Andr?, the producer of the Abril Pro Rock festival, in Recife. They recorded two demos that eventually found their way into the hands of Paulo Andr?, the producer of the Abril Pro Rock festival, in Recife. The band was then invited to perform on one of the biggest alternative music festivals in Brazil, the Superdemo. Their self-titled album, released in 1999, became a huge seller on the back of the hit single Anna Julia. Two less financially successful albums, Bloco do Eu Sozinho (2001) and Ventura (2003), followed, changing the punk-rock that highlighted their debut effort to a softer, more laid-back style. Although those two albums did not sell as much as the first one, they consolidated the band as a cult; mainly because of their so-called clever lyrics and mixture of brazilian rhytmhs with rock. Their newest record, simply titled 4 (four), was released in August, 2005.